I'm a sucker for a handwritten note; maybe it's because I studied calligraphy and addressed invitations on holiday breaks in junior high. A well lettered sign can also make me swoon; maybe that's an artifact of all the exhibits I created for public hearings in high school. Needless to say, I love both the printed and written word and wondered what was available in a rug for our living room. 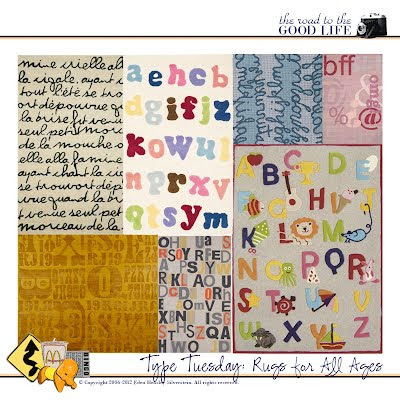 The Finds (top left clockwise) : Poem Rug, various sizes 2' x 3' to 8' x 8', $49 to $489; Hand tufted New Zealand Wool Alphabet Rug, various sizes 2' x 3' to 8' x 10', $48 to $640; Rug with Lowercase Alphabet in Cursive Form, various sizes 4' x 6' to 6' x 9', $399.90 to $799.90; Cool Expressions Rug, various sizes 2' x 3' to 8' x 10', $59 to $640; Wool Letters Area Rug, $445; Letterpress Rug, 5' x 8', $249; Letterpress Army Rug. My search was somewhat disappointing as most rugs with letters and numbers are for children. My favorite was the Poem Rug from Select Rugs. Its only downside being the color palette. My second favorite was the lowercase cursive alphabet rug from Merida Home. I like how the colors alternate in between the rows of writing, it makes the overall rug less busy. The Letterpress Rug, designed by Liora Manné, from CB2 has the perfect color palette for our living room but is a little busy. We'd need to switch out our striped floor pillows and toss pillows for solid colors. Also, the CB2 rug has been blogged about extensively since its introduction in early 2011 and probably graces the floors of many trendy lofts. Anyone know of a custom rug shop that will make a rug with your handwriting or custom design? Credits: All images taken by their respective sellers: ABaby.com, Burke Decor, CB2, Decorative Carpets, Merida Home, Rug Studio, and Select Rugs. Collage created by Eden Hensley Silverstein for The Road to the Good Life.